I seemed to have spent a fair bit of the month writing about chocolate, which is one of my favourite topics. I am aware that quite a few people are having a healthier January after all the indulgence of Christmas, so I thought I might try and hunt out a snack which is both tasty and sweet, but healthier too. What better option that popcorn? 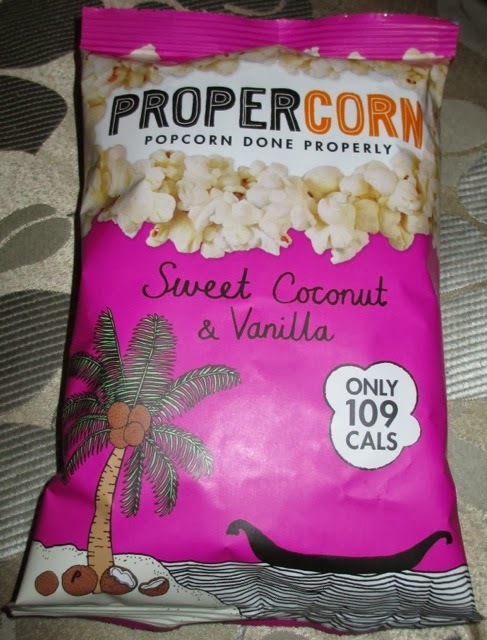 This is not just any popcorn either this is the new flavour from ProperCorn, and it sound like a rather tempting tropical mix. Its Sweet Coconut and Vanilla, and I couldn't wait to give it a taste. 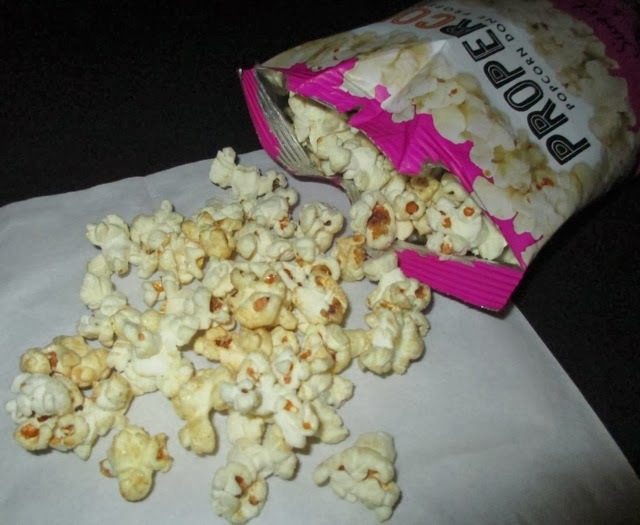 ProperCorn are proud that their popcorn is “proper” and by this they mean it is made well. Each and every piece in mine was fluffy and cooked perfectly, soft but crunchy. In my bag there were no uncooked kernels either. Also the ingredient listed were entirely natural, which is a nice touch too. Did I mention the whole bag only has 109 calories, and provides quite a substantial serving. It is a filling snack and great to munch on while watching a film (or indeed in my case the first episode of the new season of Mr Selfridge). Popcorn certainly has less calories for its serving size compared to a lot of crisps. As I poured out some of the popcorn to take a picture I could immediately smell sweet coconut, and it was a lovely natural aroma.The flavour doesn’t disappoint when you tuck in either. It is pleasantly sweet, but creamy and smooth too. The coconut is a soothing flavour, and the vanilla works well with it. It does have a nice tropical edge, but still remains pleasing and easy to eat. The coconut and vanilla seem to balance each another out, with the vanilla keeping the coconut creamy, but not loosing its smoothness. There is the slightest hint of salt to the taste too, which just gives it a little bit of definition. I love the mix of sweet and salt, and definitely saw it as an extra flavour enhancer. I don’t eat a lot of popcorn, but when I do I really enjoy the stuff. This was a fab example of why I should make the switch from crisps too popcorn a bit more often! ProperCorn do really nice lightly salted popcorn, you should try it out sometime! I've tried the sweet and salty - I love that! We look out for the salty version.